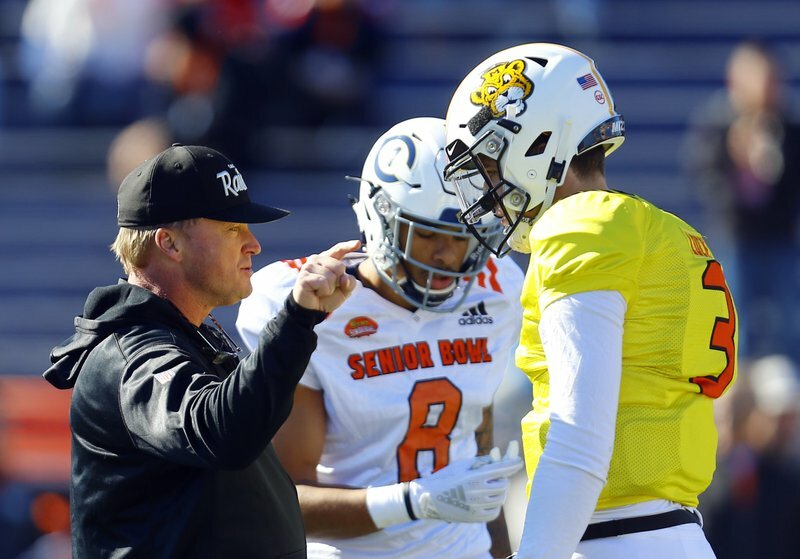 MOBILE, Ala. (AP) — Drew Lock, Daniel Jones and the other Senior Bowl quarterbacks have spent the week practicing with new teammates and learning a simplified NFL offense. That doesn’t mean it won’t be part of the evaluation process for teams considering using a draft pick on one of the quarterbacks, or any of their teammates, in the showcase game for seniors and junior graduates. Lock and Jones, North teammates, are considered likely first-round draft picks. Other top quarterback prospects, like Ohio State’s Dwayne Haskins and Oklahoma Heisman Trophy winner Kyler Murray , have also declared for the draft. The game also features two of the top pass rushers in the draft, Mississippi State’s Montez Sweat and Louisiana Tech’s Jaylon Ferguson , and a number of other likely early-round picks on the offensive line, like Washington State’s Andre Dillard. Plus playmakers such as wide receivers Deebo Samuel of South Carolina and Georgia State’s Penny Hart. The game’s eight quarterbacks took different paths to this point. Lock’s career as a four-year starter for the Tigers is almost mundane compared to Washington State’s Gardner Minshew , whose breakout season came at school No. 4. West Virginia’s Will Grier (Florida), North Carolina State’s Ryan Finley (Boise State) and Auburn’s Jarrett Stidham (Baylor) also moved on from their initial schools. Stidham, Jones and Buffalo’s 6-foot-7, 249-pound Tyree Jackson skipped their senior seasons to enter the draft. Finley and Penn State’s Trace McSorley are also playing for the North. “From a competitor standpoint, I’m going to have to tell you I do believe I’m the best quarterback in the draft,” said Lock, who passed for 10,000-plus yards at Missouri and set a Southeastern Conference record with 44 touchdown passes as a junior. “I don’t understand some of the things that have been put out there,” he said. “I’m the best quarterback in this draft. I think my arm talent’s there and my play will speak for itself. There’s no doubting his production. Grier passed for 300-plus yards in 19 of his 22 games at West Virginia and was fourth in the Heisman voting. Minshew was fifth after leading the nation in passing yards per game. Stidham didn’t put up such big numbers and had a drop-off in production last season while the Tigers struggled on the offensive line and in developing consistent playmakers.